Sleep studies at Boston SleepCare can be conducted in our in-house comfortable four bed sleep center which offers a relaxing atmosphere in a secure setting for the diagnosis and management of sleep disorders. The in-house studies (polysomnogram) take place in a private room, with beautifully appointed furniture and private bathroom. 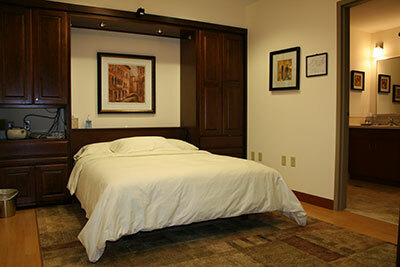 The rooms have the feel of an elegant hotel to help the patient feel as comfortable as possible. Patients often read or watch television before falling asleep. Once the patient is sleeping, important body functions and measurements are recorded and monitored by a registered polysomnographer technician in another room and interpreted by Dr. O’Brien. We provide a full report to referring doctors, including narrative, consultation, data tables and clinical correlation along with a recommended plan of care. At home sleep tests are also available for patients who are generally in the 30-50 year range and are motivated to get back to optimal health and tired of being exhausted every day.